Why a Patch? | Natural Patches of Vermont, Inc. Originally conceived as an alternative to traditional pain rubs, as a means of delivering the aromatherapeutic benefits of essential oils, Natural Patches of Vermont® Essential Oil Body Patches offer numerous advantages over not only these, but also many other traditional and aromatherapeutic products and applications, in the marketplace. Arguably the most significant advantage to the patch delivery system is that it has allowed introduction of the use of essential oils and aromatherapy, in a user-friendly and approachable format, to an entire segment of the population who may never have experienced them otherwise. In addition to appealing to those who may never have used or had no previous knowledge of essential oils and/or aromatherapy, the patch delivery system is also attractive to people who, having used either or both in the past, may have been discouraged from continued use for any number of reasons. Unlike the pain rubs, which inspired their development, by using a proprietary process by which the essential oil blends are encapsulated in an adhesive layer, Natural Patches of Vermont® Essential Oil Body Patches provide the targeted benefits of essential oils without feeling greasy or oily. Leaving no oily residue on the skin, either during use or upon removal, the patches require no clean-up and can be worn day or night, without fear of damaging clothing or bedding. Natural Patches of Vermont® Essential Oil Body Patches do not possess the over-powering smell exhibited by most pain rubs and balms. So discreet is the aroma, that no one around you will be aware that you are even wearing the patch, unless, of course, you want them to. As the name implies, Natural Patches of Vermont® Essential Oil Body Patches do not employ the use of artificial colors and fragrances and, additionally, do not contain latex or pharmaceuticals of any kind, all characteristics that offer advantages over not only rubs and balms, but other patches in the marketplace, as well. With all the information available on the subject, some of it conflicting, many people may find the use of essential oils mysterious and intimidating. 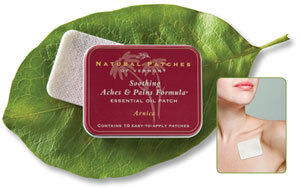 Natural Patches of Vermont® Essential Oil Body Patches are neither mysterious nor intimidating. Convenient , user-friendly and requiring no time or special materials for use, they provide the aromatherapeutic benefits of custom oil blends aimed at addressing various common conditions and complaints without the mess and bother often associated with the use of essential voils. Many essential oils can be irritating to the skin and therefore must be handled with care and properly diluted before use. In Natural Patches of Vermont® Essential Oil Body Patches all of our essential oils are combined with an olive oil carrier and applied to the patches in concentrations designed to provide maximum aromatherapeutic benefits, while minimizing the possibility of adverse skin reactions.To further ensure against adverse skin reactions, the adhesive used in Natural Patches of Vermont® Essential Oil Body Patches has been formulated and tested for bio-compatibility (skin-friendliness). With all the demands of modern life, most people do not have the time or inclination to weed through volumes of literature to locate suitable oils or recipes, purchase oils and mixing materials and undertake the preparation of their own custom oil blends, should they chose to use multiple oils in combination.Natural Patches of Vermont® Essential Oil Body Patches require no major outlay of time. All you have to do is decide which of our custom oil blends fits your needs, remove the patch from its packaging, apply it and begin enjoying thearomatherapeutic benefits. As for convenience, since there is no liquid, Natural Patches of Vermont® Essential Oil Body Patches can be tucked into apocket or purse for use anytime throughout your busy day. Essential oils are prone to instability and must be stored properly to ensure preservation of their unique fragrance profiles and aromatherapeutic properties. Stored in the incorrect size, color or type of container essential oils can rapidly degrade and, in extreme cases, be rendered ineffective and unusable.Natural Patches of Vermont® Essential Oil Body Patches come in packaging explicitly designed to safeguard the integrity of both the patches and the essential oils. Both the tins and pouches are constructed of non-reactive materials that also act as vapor and light barriers, protecting the essential oils from those elements which most often result in their degradation. Not only can high quality essential oils be expensive, their use often requires the purchase of various mixing and storage supplies, as well as, diffusers, misters and the like.Natural Patches of Vermont® Essential Oil Body Patches require no additional materials for use. The patches could not be easier to use. Simply remove the patch from its packaging, remove its protective liner, and place it on the body at the site specified on the packaging. Following application, body heat will activate the essential oils, releasing their aromatherapeutic benefits, which may last up to 24 hours and in some cases longer. Not only are Natural Patches of Vermont® Essential Oil Body Patches easy to use, our packaging has been specifically designed with portability in mind.Both our 10-Patch Tins and individually wrapped patches fit easily into a pocket or purse, for Aromatherapy-on-the-Go. They are especially convenient for air travel. Packed in a carry-on or checked bag, because there is no liquid they will not cause damage to other items in you baggage or delays in the screening process. The understated appearance and aroma of the patches allows for their use in situation where the use of other aromatherapy products and applications might not only be impractical, but in some cases frowned upon.Unlike other highly scented aromatherapy products, whether intended for topical application (balms, creams, lotions…etc.) or inhalation (diffusers, candles, mists…etc. ), the aromatherapeutic benefits of Natural Patches of Vermont® Essential Oil Body Patches can be enjoyed even in the closest of quarters, with confidence that you will not draw attention to yourself or irritate or offend those around you, whether they be strangers, friends, spouses or co-workers.